You don’t have to do something crazy to make a difference this Earth Day. Just take the pledge to choose ENERGY STAR certified appliances, electronics, lighting, and other products that have been independently certified to save you energy, money and help protect the climate. You’d be crazy not to. 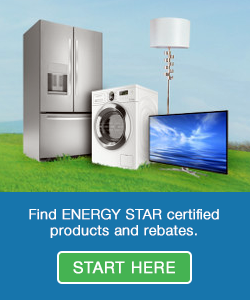 I pledge to choose an ENERGY STAR certified product to save energy, money, and help protect the climate. Thank you to participating partners for celebrating Earth Day with ENERGY STAR and encouraging your audiences to take the Pledge. Make a commitment to Flip Your Fridge to an ENERGY STAR certified model. If all old refrigerators in the U.S. were replaced with ENERGY STAR certified models, Americans would save more than $330 million in energy costs and prevent more than 5.5 billion lbs of greenhouse gas emissions annually, equivalent to the emissions from approximately 550,000 vehicles or the annual electricity use of more than 300,000 homes.